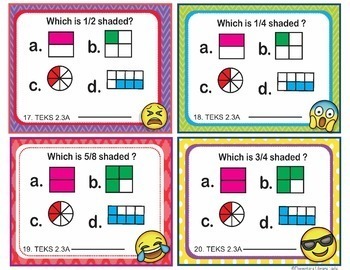 This is a set of 25 numbered (and repeated unlabeled/un-numbered) task cards with 25 different 2nd grade math problems, aligned to Texas TEKS 2.3A. Note that Common Core is NOT mentioned or referenced in this standard. 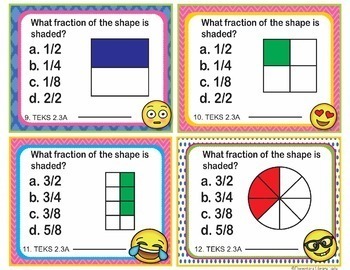 These problems require the student to create and identify fractions in halves, quarters, and eighths. 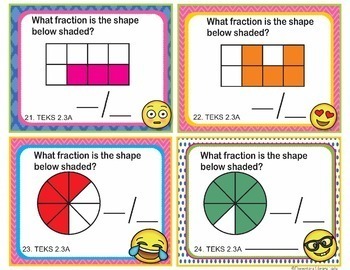 An answer key, as well as a blank answer sheet, are also provided, as well as two posters for the Texas standard. 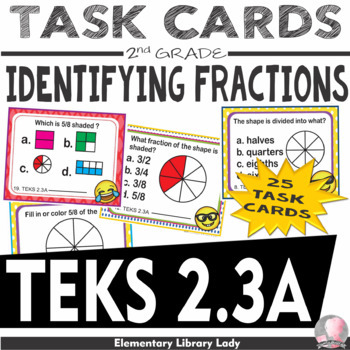 These task cards are labeled as TEKS 2.3A, with a cover sheet and the standard on each numbered card. Please let me know if you have any questions or suggestions - I'm always creating!